Ten days after leaving Earth in the nose of an Atlas 5 launcher, the Jupiter-bound Juno spacecraft is flying straight and true, allowing NASA managers to cancel a planned rocket burn to aim the probe toward the next waypoint on its five-year journey to the solar system's largest planet. The decision to call off the clean-up maneuver later this month will move forward initial testing of Juno's suite of scientific instruments, according to Jan Chodas, the mission's project manager at the Jet Propulsion Laboratory in Pasadena, Calif.
"Because we canceled TCM 1, we will start the instrument low voltage checkouts earlier and perform them at a more leisurely pace," Chodas said. One of Juno's sensors, a plasma and radio experiment named Waves, was activated and deployed its antennas Aug. 9, according to Chodas. Waves will measure plasma and radio activity in Jupiter's auroras. Chodas said the remaining instruments, including a radiometer, magnetometer, particle detector, and infrared and ultraviolet payloads, will be checked out between Aug. 22 and Sept. 2. A series of high-voltage tests before the end of the year will verify full functionality of all the instruments. Once Juno arrives in orbit around Jupiter, its research payload will peer deep inside its thick atmosphere, map its magnetic field and trace the origin and evolution of the solar system's king planet. The Juno control team stationed in a Lockheed Martin Corp. facility in Denver transitioned the spacecraft from the launch phase to the first cruise phase on Aug. 8. All 12 of Juno's reaction control system thrusters have been fired successfully. 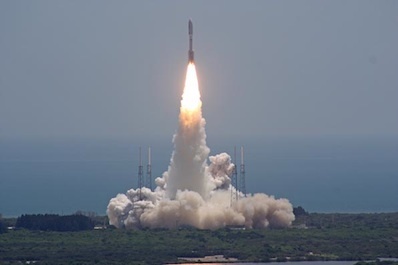 The craft's main engine, capable of generating up to 150 pounds of thrust, won't be used until a pair of deep space maneuvers planned for August and September of 2012. 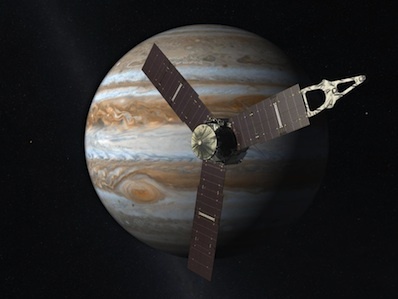 The main engine burns next year will guide Juno back toward Earth for a flyby in October 2013. Earth's gravity will give the probe a velocity boost needed to reach Jupiter in July 2016. "We are working a few minor issues, mostly involving temperatures of some components not matching their predicted values," Chodas said. "No big concerns, we just want to make sure that we understand the spacecraft's thermal behavior and that we update our models as needed. We might turn on a heater if a device is a little cold. Some temperatures are still stabilizing so we're not at steady state across the board yet." 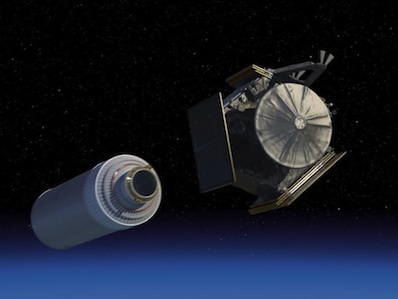 Juno launched Aug. 5 from Cape Canaveral at 12:25 p.m. EDT (1625 GMT). The Atlas 5 rocket successfully deployed the 7,992-pound spacecraft on a course departing Earth less than 54 minutes after liftoff. Moments later, the spacecraft unfurled its three 29-foot-long solar panels and began to charge its batteries. Juno's solar wings are composed of 18,600 efficient solar cells, and when it reaches Jupiter, the spacecraft will be the furthest mission from the sun to ever operate on solar power. "All the arrays came out nominally," said Tim Gasparrini, Juno program manager at Lockheed Martin, the spacecraft's prime contractor. "They all latched up like we wanted." Gasparrini said a cover over Juno's main engine was also moved shortly after launch. The engine shield, solar panels and Waves instrument antennas are the only deployable appendages on the spacecraft, and all those are now successfully completed. In addition to scheduled instrument testing, engineers will spend the next few weeks closely monitoring Juno's systems through daily communications opportunities with NASA's global Deep Space Network ground stations. The communications passes will become less often later in Juno's cruise, but engineers want as much insight as possible this soon after launch. "We have to learn how to fly our spacecraft," Gasparrini said.